This article is by Subhajit Dey. This entry was posted on Monday, May 6th, 2002 at 7:11 pm	and is filed under Bam Chika Bam Bam. You can follow any responses to this entry through the RSS 2.0 feed. You can leave a response, or trackback from your own site. 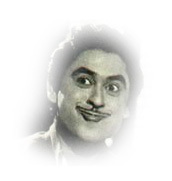 It is true that most cricketers have told in interviews(like Sachin,Dhoni,Pathan,Rao)that Kishoreda is their favourite singer.Foolish Unknown1,this have been written as it is a site dedicated to genius Kishore Kumar,not to mediocre singers like Mukesh and Rafi. It is good sense of humour, co-relating the body language of cricketers with KK songs. Good peace of research. kk is the great guru.i m mad abt him.he is the inspiration for my succeess.he is the only medicine for my wound. KKs songs had “shor” only….. nothing special. Hats off to the genius Kishoreda. My Best of the Best Music Guru. He is just “Mind-Blowing”, nothing to say much. Today is the Death Anniversary of the Biggest Legend. Rest In Peace. This was hillarious, Mind-blowing dudes….